By now we all know the earth is warming up and that brings all kind of problems and this t-shirt shows that message. 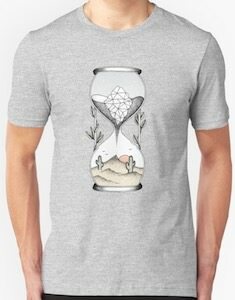 On the t-shirt you can see and hourglass with on the top and iceberg melting and in the lower part you can see the desert getting a little bit of water from the ice berg. So while looking amazing this t-shirt have a message about global warming so you can look amazing in this t-shirt while still giving a message to people the look a bit closer. You can get this t-shirt 17 colors and it comes in sizes Small – 3XL. Global warming is a thing and if we all would think green a bit more we could help our planet from getting worse. The think green t-shirt comes in green but also in different colors and it comes in many sizes and styles for both men and women and different clothing with the same design is also available. 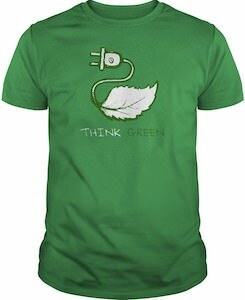 On the shirt, you can find a power plug with a cord on it and from there it goes into a leaf and that would be a great way of green power. Below the cool image, it says “Think Green” and that means that if you wear this t-shirt you may make people think green and that could help us all. This t-shirt is perfect for people that like to make the environment better and can’t stop talking and convincing people about that. 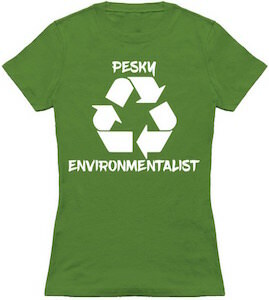 On the t-shirt, you can see the famous recycling symbol with 3 arrows and the text “Pesky Environmentalist”. It sure is funny and would make a great shirt for yourself but also great as a present for your favorite Environmentalist. You can get this t-shirt in many colors and sizes ranging from Small – 6XL and it is available in styles for both men and women. Start changing the world by wearing this t-shirt so that people know that you will keep bugging them about making the world better. Are you environmentally conscious and want to show your support for alternative energy sources? It’s wind energy at its finest! 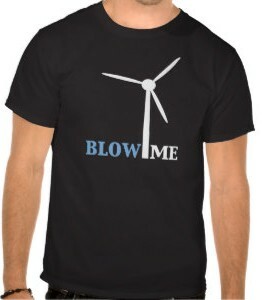 This men’s t-shirt features a large white wind turbine and the phrase “Blow Me” in a simple yet humorous way. The t-shirt is made from 6oz, pre-shrunk 100% cotton. It is also casual and loose fitting which makes it great for any type of weather. The sleeves and bottom hem has been double stitch to ensure durability. The full range of sizes are available and many colors including lavender and Texas orange. 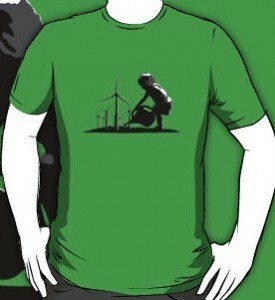 Make your friends and strangers a like laugh and think about the environment with this Blow Me Wind Turbine T-Shirt. The power of wind, a great way to teach our children the basics of saving the planet. This a great t-shirt that has a little girl watering a field of windmills bringing together the power of wind and our children, which is the future. You can find this great message of winds of change print on different styles of shirts, also available in many sizes and colors. Check out this Winds Of Change T-Shirt. Green energy sources are the way of the future. 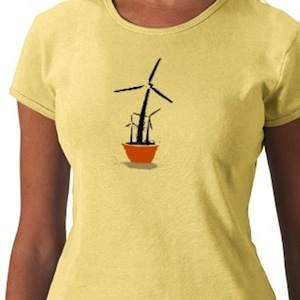 And this t-shirt shows that we need to plant some more wind turbines that can bring us this wind power flower. This t-shirt witch comes in different styles and colors for men and women can promote the environment and help us get cheaper energy. Support the cause for cleaner energy by wearing this Wind Power Flower T-Shirt. OK so we should of course all think of the planet and that is why we should stop wasting drinking water. Some of us could have different motives to stop wasting water. This funny t-shirt shows a shower and below that the words “Don’t waste water shower together”. And this trick to conserve water could have positive side effects. This funny shower t-shirt comes in yellow and in a range of sizes. 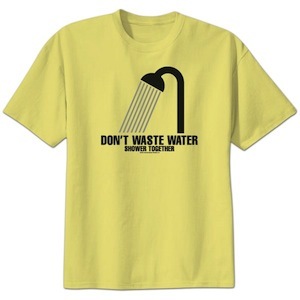 So promote the environment with this Don’t Waste Water Shower Together T-Shirt. 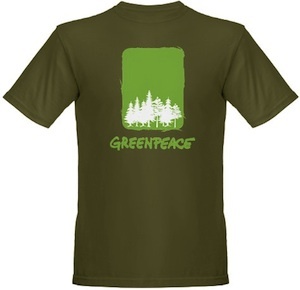 This is not just a pretty t-shirt with the word “Greenpeace” and a forest off trees on it. No this is a Greenpeace t-shirt and by getting this shirt Greenpeace will get money to campaign for our planet. So by getting this shirt you don’t only have a great looking tree t-shirt but you also support Greenpeace. Go order your Greenpeace Trees T-Shirt. Celebrate Earth Day Everyday that is what this t-shirt says. Why would we only try to help the earth one day a year on earth day? Ok it is better then no day at all but if we all wear a shirt like this we can maybe get some people to help our planet a few more days a year. 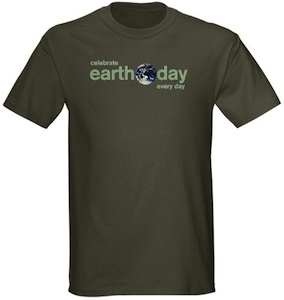 Go get your Celebrate Earth Day Everyday T-Shirt. Save the planet by keeping it clean because Earth is not Uranus. A great t-shirt for people who care about our planet. So if you do then get this Keep The Earth Clean T-Shirt.